We extend a warm welcome to all who come seeking a place to pray. Here you will find information about St. Crida and how to find the church. There are details about our organised Celtic Quiet Days and suggestions about visiting alone. The church of St. Crida is a quiet beautiful place where generations of people have come to find peace in the midst of their busy lives. If you are seeking Christ He is surely here. You are most welcome. You are welcome to book the church for your group and organise your own quiet day, or, if you wish, we can 'tailor make' a day especially for you. Please phone Canon Pat Robson in order to discuss your requirements. Please book online or telephone Pat. Cost £6.00 each, payable on the day. Each day will start at 10.00 am with tea or coffee at the back of the Church and will finish at 4.00 pm. Please bring a packed lunch. A bowl of hot soup will be available at lunch time for £2.50p. There is a toilet adjacent to the car park. It might be advisable to wear sensible shoes and bring a jacket or coat (just in case!). Tuesday 7th of May 2019 with Rev'd Linda Whetter (Probus Team). 'The Cup of your Life.' Bring your favourite mug or cup. Friday 7th of June 2019 with Canon Pat Robson (Probus Team). 'May your God go with you.' A reflection on the impact that refugees have on institutional religion. The Church of St. Crida is open every day from 9.00am until it gets dark. There is good car parking and a toilet adjacent to the car park. Visitors with wheel chairs are likely to need a companion to help them on the approach to the main door. The Church is in a quiet and secluded area and is a place of prayer and sanctuary. You are most welcome to come into the Church to sit and pray or, of you wish, you can make your own pilgrimage around the grounds. If you follow the mown paths you will find benches where you can sit in the sun and relax and enjoy the wild flowers and the songs of the birds. Each month you will find a different card on the table inside the main door with a pilgrimage theme that you can take with you as you walk. This can be a prompt to help you in your prayers, and you can take it home with you when you leave. We would be delighted if you decide to visit again and again in order to make St Crida's your own special quiet place. Quiet or desert places were important in Celtic Chrisianity as places where people could be alone with Christ and get to know and love Him as a soul friend. Please consider visiting again and please sign the Visitor's Book before you leave so that we can remember you in our prayers. When the Saxons invaded the east coast of Britain in the 5th Century AD, British families fled in panic to the west. Some took refuge in the Welsh valleys but many more trekked down through Cornwall in order to journey by boat across to France. The refugees settled to make a new life for themselves in these Western lands. Their soldiers patrolled a border from York to Dorchester and they gradually began to put down roots. Their Christian faith was important to them and their priests and teachers taught the children to keep this faith alive. When they were old enough, many of the young people were anxious to spread the Gospel and they travelled backwards and forwards through the Wetsern lands of Britain and France, preaching the love of Christ. Crida was the youngest daughter of King Mark, also known by his Celtic name of Conomorous, who ruled over middle Cornwall from 515 to 560 AD. 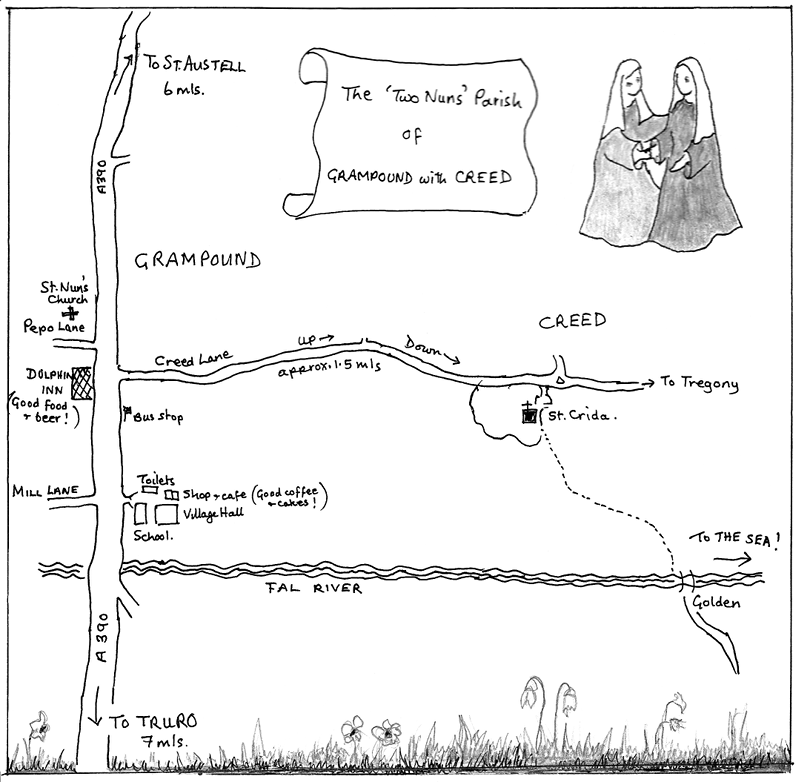 Crida persuaded her father to give her some land by the river Fal to build a nunnery where she and her nuns could care for the travellers while they waited for boats to take them across the Channel. This became the nuns' mission for many years and travellers found rest and sanctuary at Creed on the quiet, eastern shore of the Fal, opposite the busy Roman fort of Golden. Legend tells us that Crida would instruct the nuns to choose a different place to pray each day. She told them that when they prayed Christ would come and stand beside them to listen to their prayers, and, where His feet touched the earth, the ground was made Holy. She wanted them to pray in different places so that eventually all of the land would be sanctified. Please help us to continue that tradition in her honour. If coming from St Austell or Truro drive to Grampound which is on the A390. In Grampound turn south along Creed lane (the lane is just uphill and on the opposite side of the road from The Dolphin Inn). Drive along Creed lane for about 1 mile until you reach Creed. The church is on the right. The number 27 bus goes through Grampound from Truro or St Austell direction - get off near The Dolphin Inn. Head south along Creed lane (the lane is just uphill and on the opposite side of the road from The Dolphin Inn). Walk along Creed lane for about 1 mile until you reach Creed. The church is on the right. 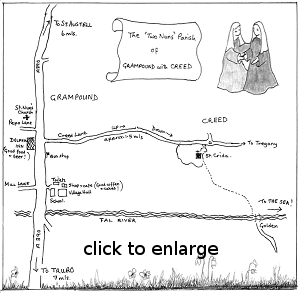 Website maintained by Grampound with Creed Churches. Design by Agnate.